Display your reports, graphs, and charts on your own site. Alright, we got some good stuff to announce today. Thanks to our man Alex, who added some sweet caching action to Wufoo reports over the last few weeks, everyone should have seen a nice boost in speed on the loading of their reports, charts and graphs. One of the nice side effects of implementing caching for our reporting system is that we were able to use that as the foundation for creating code snippets to integrate your reports and widgets into your own web sites! 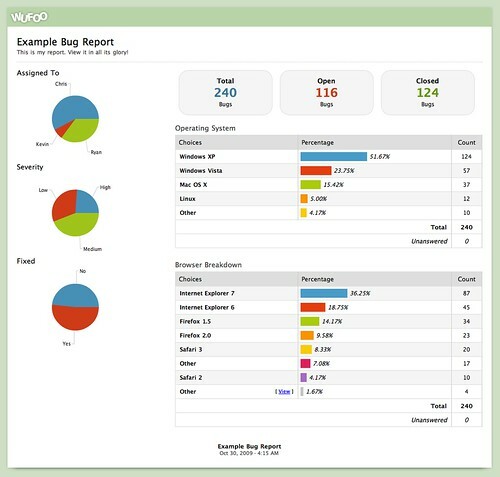 Convenient copy/paste URLs and HTML links to your Reports hosted on Wufoo. You’ll see that we now provide encrypted permanent URL structures for users wanting links that wont change when you edit your Report’s name. 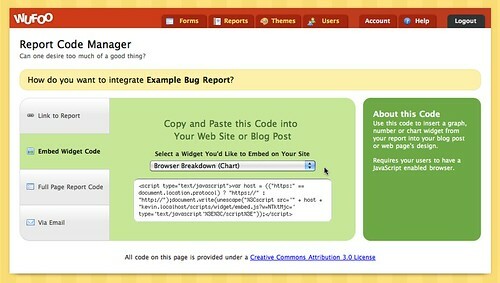 Downloadable HTML file to instantly get a full page version of your report on your site. Just like our Full Page Form Code file, all you have to do is upload the file to your server and you’ve got a Wufoo report showing from your own domain. One click pre written email for sharing your report with friends and fellow data lovers. Yup, that’s a live widget up there based on filler content collected from one of our example forms. Or if you want to create a mini dashboard highlighting a specific metric, you can insert just the number widget from the report like this! The possibilities are really endless. These embeddable widgets are based on live data collected from your Wufoo form, which means they’ll automatically update as new entries are collected. 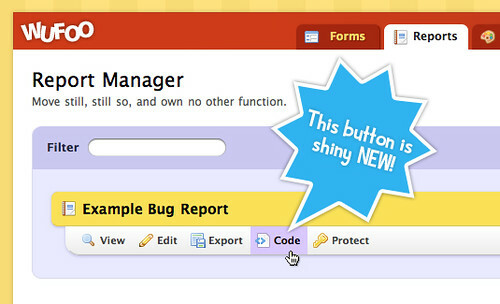 Because they’re based on the widgets in your report, any filters you apply or changes you make to that widget in Wufoo’s Report Builder will also automatically be reflected on the embedded version. These new features are available to all users across all plans and we hope you enjoy showcasing your data in new and exciting ways!